NOT been on a steady schedule of 30 minutes of writing per day. In fact, I think that I have written for all of three days (though for about 90 minutes a piece). Some things have gotten in the way…or rather, I have allowed them to get in the way. There was the Independence Day holiday, which included a day-trip with the wife. And there was…well, then it…OK…just my unmitigated lack of motivation. I have signed on as a content developer for Nevermet Press. This is a new open-source gaming company. It really is a rather cool idea and I hope it will be a good foot in the door for writing permanently. If I can get my rapidly expanding backside into a seat and actually convert words and ideas to megabytes. One would think that I didn’t enjoy writing the way I keep avoiding it. It’s hard to explain…I don’t understand it myself. I suppose if I did it would be less of an issue and I would know what to do about it. I have come to the conclusion that I do a better job if I actually leave the house to write. Most of my writing has been done at the coffee house and other places. I’m not confident that I would spur myself with a writing space in my home. A daily schedule isn’t going to cut it either. Perhaps if I give myself deadlines. Complete X by Y. This may push me to juggle my time better. So I’ll look at what I’m working on and give it a shot. I’ll keep you posted on my progress (or lack thereof). 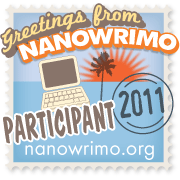 This entry was posted in Ramblings and tagged motivation, writing. Bookmark the permalink.